Derick Byrd runs in the Thunder in the Valley Game at Saginaw University in Michigan in 2009, after only having his prosthetic leg for eight months. He earned four gold medals and one silver medal in the events during the games. 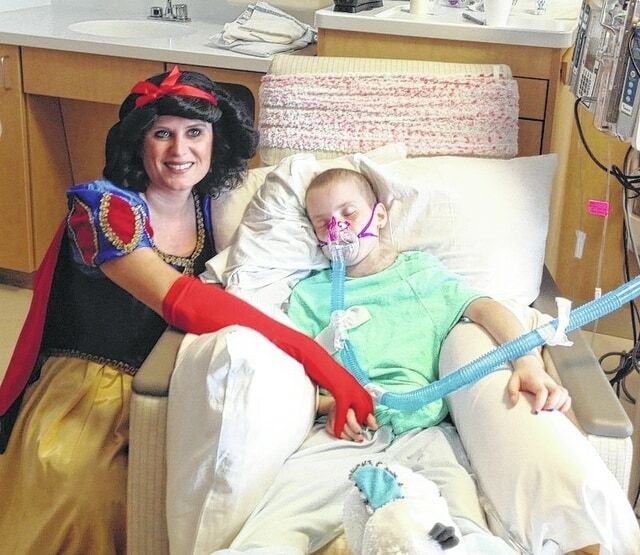 Legacy Strongheart Foundation Founder Terra Byrd-Grupe is Snow White in this picture with Lauren McManaway at the hospital a few days before McManaway died of ovarian cancer. McManaway was a student at Triad Elementary. Her mother is secretary with the foundation. NORTH LEWISBURG – Youths fighting cancer or dealing with mental or physical disabilities have a new place to turn for assistance. The Legacy Strongheart Foundation seeks to help children and families in the area deal with mental and physical illnesses and disabilities, in addition to cancer treatment. The foundation, founded by Terra Byrd-Grupe in May, grew from Byrd-Grupe’s son’s cancer battle. Byrd-Grupe said she has been involved with the local chapter of the American Cancer Society since 1998, both on the board of directors and through Relay For Life. She had a team at Relay with the cheerleaders she coached. She formed Derick’s Team in 2004 after her son’s 2003 osteosarcoma cancer diagnosis. Osteosarcoma is a bone cancer. Derick, 20, survived his cancer and is active in the foundation. Byrd-Grupe said she has had other family members diagnosed with cancer and knows many children in the Triad school district and surrounding communities who have had a variety of cancers. Byrd-Grupe also saw a need for the foundation after seeing the number of children in the area needing treatment for a variety of cancers. She is a former Triad Local Schools teacher who resigned this year to devote her attention to the foundation full time. “Pediatric cancer is supposed to be rare, but it doesn’t seem to be so rare in our area,” she said. The foundation help families get what they need, such as financial assistance and quality-of-life improvements. Byrd-Grupe said often private insurance does not cover items to make life easier for people, such as hearing aids, or will not kick in until insurance deductibles are met. Vice President Trent Spriggs struggled firsthand with the cost of an insurance deductible when his wife found a lump in her breast in May 2014. She needed a biopsy, and the medical provider they contacted first would not do it unless the $3,000 insurance deductible was paid first. When the family asked if they could pay in installments or be on a payment plan, the provider refused, so they had to find another who would accept payments toward the deductible. The lump was a sign of breast cancer. “Nobody should have to worry about deductibles or how they are going to make finances happen when they are sick or fighting for their life,” he said. Beyond cancer assistance, Byrd-Grupe said she wants the foundation to help those with disabilities. She said she saw students at her school with autism, cognitive delays and mental or physical handicaps, and she wants to help them. Foundation President Rhawn Jackson said he joined the foundation after having experienced disabilities with his daughter. The foundation will host an open house from 11 a.m. to 7 p.m. Thursday, June 18, at the Brush Lake Lodge, 8371 Brush Lake Road in Woodstock. The event will feature the royalty of the foundation – Ariel, Belle, Cinderella and more – and will have refreshments and entertainment. Some area businesses are lining up to help with the foundation’s efforts and will be at the open house. For more information, contact Byrd-Grupe at 937-869-4308 or at TerraGrupe@gmail.com. The foundation is also on Facebook.